An ultra high resolution topographic dataset covering major fault systems in Southern California was produced using Airborne Laser Swath Mapping (ALSM), airborne photogrametry and GPS. The survey area included nearly 1000 km of the San Andreas and San Jacinto faults, from Parkfield in the north to the Salton Sea in the south. Typical airborne LIDAR surveys provide vertical surface point accuracies of ~15 cm but this survey should provide significantly improved measurements with accuracies approaching 5 cm in the vertical and sub-meter in the horizontal. This enhanced resolution was achieved by conducting multiple aircraft overflights combined with densely spaced, high-precision geo-referencing surveys that included ground based GPS receivers spaced every 10 km along the flight lines. The primary survey took place in May 2005, and a secondary survey was completed in mid August 2005. The data produced by these surveys are collectively referred to as the B4 dataset. Similar surveys will be conducted following the next major earthquake on these fault systems. This was the first scientific ALSM survey to be conducted at this scale. Numerous institutions participated in this project, including the Ohio State University, the National Center for Airborne Laser Swath Mapping (NCALM), the U.S. Geological Survey, and UNAVCO. UNAVCO provided 17 GPS systems (Trimble R7 receivers, choke ring antennas and tripods) as well as engineering and data archiving support. 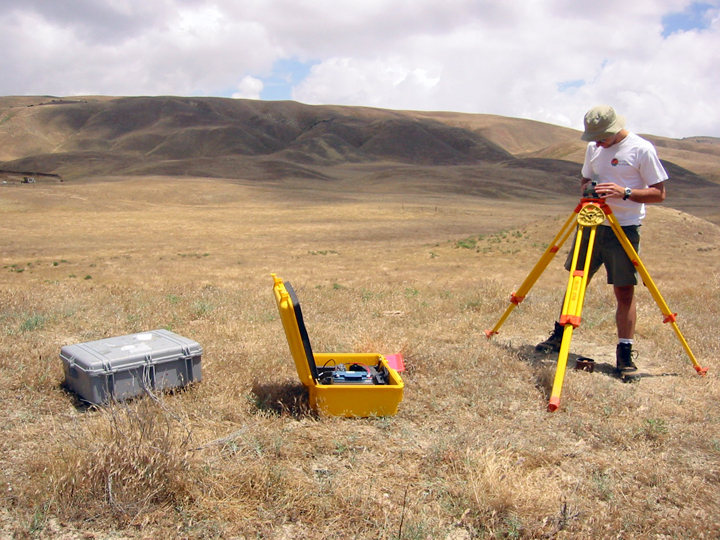 Photo shows UNAVCO GPS receiver being deployed near the San Andreas Fault at Carrizo Plains, CA, during the B4 ALSM survey (photo by Francine Coloma).